We engineer solutions that combine traditional water technology with our new, simple yet revolutionary methods of water delivery. TOHL offers both Permanent and Mobile Infrastructure solutions. We are a global industry leader in water logistics and infrastructure, changing the way people think about worldwide water access. We are driven to improve the quality and quantity of water of the more than 700 million people without access to reliable water sources worldwide. We engineer water solutions for the people who need it the most and do so with simple, ground-breaking technology. Our team designs, engineers, constructs, operates, and maintains water systems ranging from conventional, permanent water infrastructures to our industry-first Mobile Infrastructure for emergency situations and remote water access. When conventional infrastructure is inadequate, we install Mobile Infrastructure with huge rolls of HDPE pipe unwound from a helicopter, getting water from point A to point B. Our technique successfully covers rough terrain and gets clean water to the people who need it in a matter of minutes. TOHL reinvents piping infrastructures to minimize disruptions in water supply during emergency response logistics. Earthquakes and other disasters often destroy water infrastructure, with roads and pipes damaged and water trucks unable reach local communities. In emergency situations, TOHL partners with local authorities, local organizations, and the local community to rapidly install a Mobile Infrastructure system. A Mobile Infrastructure system can be set up hours after a natural disaster, and removed, reused or recycled at convenience. TOHL's solutions seamlessly integrate with conventional emergency response water solutions, moving water to save lives. We believe that sustainable engineering starts with the community. We involve local communities in the design, construction, and maintenance of the water systems in underdeveloped areas. We hold workshops for local communities in proper usage and maintenance of water systems. Our training sessions enable locals to take charge of their water resources for many years to come. When we do not own the infrastructure upon project completion, we help the community organize into a legal entity that can leverage payments from users for system maintenance. We never assume that one solution will work in every country or environment. Instead, we customize water logistics to the geography, time constraints, and budgets of our clients. Local community members and authorities are active participants in the design, construction, and maintenance of our water projects. Whether we are designing a permanent underground water distribution network for a community or deploying our Mobile Infrastructure in a crisis situation, we always consider the social, natural and political environments of our projects to ensure successful water distribution. Our versatile team of engineers hammers out the technical details of every project. We maximize the quantity and quality of transported water, optimizing parameters like flow rate and water pressure. TOHL's engineering services include project modeling, hydraulic calculations, and technical project specifications. Our engineering is sustainable, leaving minimal environmental trace. We believe in sustainable, helpful and competent water delivery. TOHL executes construction projects involving pipelines, water treatment systems, waste water systems, deep wells, pumping systems and storage facilities, to name a few. Our projects range from excavation and installation of pipelines via traditional methods to installation of pipelines via helicopter. TOHL provides full construction and project management services. TOHL operates water systems with a distribution model similar to that of a utility company. People who receive water from TOHL directly into their homes are required to pay regular utility fees. When projects demand community-wide distribution instead of individual distribution, TOHL constructs centrally located water kiosks manned by locals. People can retrieve water from the kiosks for a small fee. When TOHL does not own the infrastructure that is constructed, it ensures that the community has proper technical training and organization to maintain and operate the system for many years to come. TOHL oversees maintenance instead of outsourcing it to other companies. We train communities in each project region in the operation and maintenance of our water infrastructures through onsite workshops. In cases where TOHL does not own the infrastructure at the completion of the project, we help the community organize into a legal entity that can leverage payments from users for system maintenance. 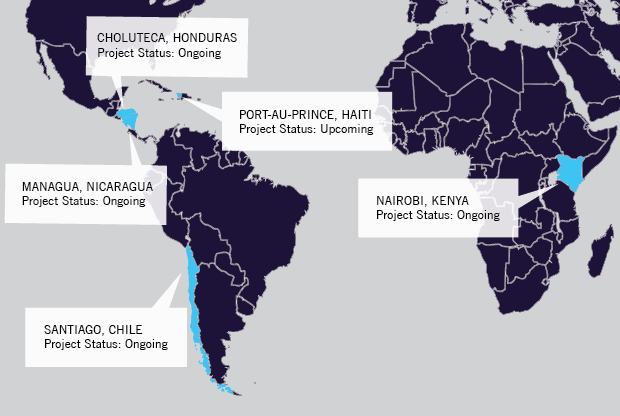 Our projects extend across the world to four countries and three continents, moving water to save lives.